If ever the city of Auckland, New Zealand, had to offer its best, Devonport would be it. Situated a mere ten minutes by ferry from the Auckland Central Business District, Devonport is a pleasant treat for the senses. Beautiful Edwardian heritage buildings, spectacular bay scenery, and stunning beaches, this village by the sea has it all! 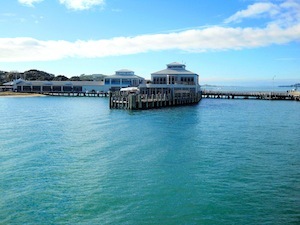 Devonport welcomes its visitors, many of whom are surprised that the little seaside village isn’t actually an island but an extended part of the Auckland peninsula. Passersby are immediately greeted by the amiable atmosphere that surrounds the village. With children playing on the beach, mariners sailing past on the blue water, and New Zealand’s own Christmas trees — Pohutukawas — in full bloom with their red flowers blowing in the wind, Devonport maintains a unique charm and a pace of life that is relaxingly different from the rest of Auckland. The most imposing and immediately visible building in Devonport is The Esplanade Hotel. Situated on the intersection of Queen’s Parade and Victoria Road, this Edwardian baroque revival hotel completed in 1903 served as an accommodation point for ferry travelers arriving at the crossroads between the city of Auckland and the rest of the North Shore. The Esplanade features an assortment of suites and rooms catering to a variety of travelers, local and international alike. The lavishly-decorated Sir Peter Blake Suite appeals to a range of holiday-makers from wealthy international visitors to local history buffs. The hotel also boasts a vintage bar and several antiquities from crystal chandeliers in the hallway to a timeless brass chess set sitting comfortably in the coffee room. It is as if time stopped in the 1900s right here in this hotel, and this feeling manifests itself with the art deco furniture waiting in little nooks to embrace its guests together for a friendly conversation over a cup of coffee. Whether it be something for history buffs, beach-going families, or the avid adventurer — scaling the side of Mount Victoria, one of Devonport’s local ‘mountains,’ for example — there is always something to do and the little village unsurprisingly ends up spoiling visitors with choices. 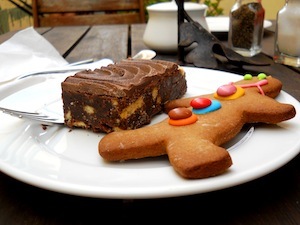 Try having a light brunch at Devonport’s Stone Oven Bakery and Cafe, a little red and white cafe around the corner of Clarence Street, with its vibrant atmosphere and cheerful staff. Cozy, warm, and homely within, the cafe embodies a contemporary household character, while wooden tables and chairs that spill onto a deck outside make a perfect background for a breezy conversation over an open-air lunch. Chocolate lovers will be most delighted to hear that Devonport has its own chocolatier. Devonport Chocolates on Wynyard Street designs some of Auckland’s most unique and tastiest treats — the chili chocolate row is a must — but the lemon and date truffles remain the shop’s signature icon. Try the exotic habanero mix range for a spicy sweet kick or a cherry liqueur mouthful for a perfect sweet indulgence! History buffs will absolutely love an evening stroll on King Edward Parade. The street is famous for the many Victorian houses overlooking the bay — undoubtedly some of the most prime real estate in New Zealand. At the end of King Edward Parade, about a twenty-minute walk from the Devonport town center, is the Navy Museum. The museum contains a full catalog of New Zealand’s naval history, from its humble beginnings to the country’s over sea campaigns with the Allied Forces during the World Wars, right up until the Navy’s on-going participation in the Pacific campaigns and the defense of New Zealand’s coastal borders. The museum has it all, including models of battleships, authentic antiaircraft gun attachments once fitted to naval warships, the distinctive white and blue sailor uniforms, and replicas of on-board apparel. A weekend of sun, sand, rich history, good food, and good company is what Devonport has to offer — a combination sought out all around the world, wrapped up in one little village. Madeira—Too Good to be True?